What do you expect to see in your room when you check into a design hotel? LED wood desk lamps, animal paperweights, and teacups? Modified transfusion chairs and human body exhibits? A cuckoo clock-tree and dove floor lamps? A lucky chicken? Or would you rather select the tables and the chairs, the lamps and the coat racks, and even the books on your own? You can do that in Taipei. In the past, you’ve traveled to the capital of Taiwan to eat, to shop, to visit temples, and to eat some more. But it never really mattered where you stayed. You focused more on the district—Wanhua, Datong, Zhongshan—than the hotel itself. Until Play Design Hotel opened that is. Play Design Hotel is in Datong. The district along the Tamsui River is one of the oldest parts of the city. Due to its shipping wharf, it later became the economic center of Taipei. Markets, museums, and, yes, temples, now stand among the Japanese and Qing architecture. On the fifth floor of a nondescript building, a boutique hotel now does, too. This is not your typical hotel. Play Design Hotel doesn’t serve breakfast or room service. It doesn’t have a pool or a gym either. But it does have a thoughtful staff. They provide cold water and a unique local map upon check-in. There’s a public balcony. The spare space features iron window grills, abandoned pipes, and hanging tables. There’s the Select Shop. It’s stocked with the unique items, all made in Taiwan, that you can take home after falling in love with them in your room. Oh yeah, the rooms. They’re the most important parts of this hotel. There are five rooms—yup, it’s really small—at Play Design Hotel. Each large room features concrete floors and walls, big windows, a washer and a dryer, and a mini-fridge stocked with drinks. That’s where their similarities end. The Future Lab room showcases avant-garde Taiwanese design by combining art, biology, and design. The Naho Selections room was curated by a Japanese illustrator. The Play Tea room is where classic Taiwanese tea meets modern Taiwanese design. The MIT 3.0 room focuses on natural materials. While the Maker room is filled with contemporary technology. Then there’s a sixth option. It’s the Guest Selections room, which is redesigned (options are shown in advance online) for each guest based on their likes and dislikes. 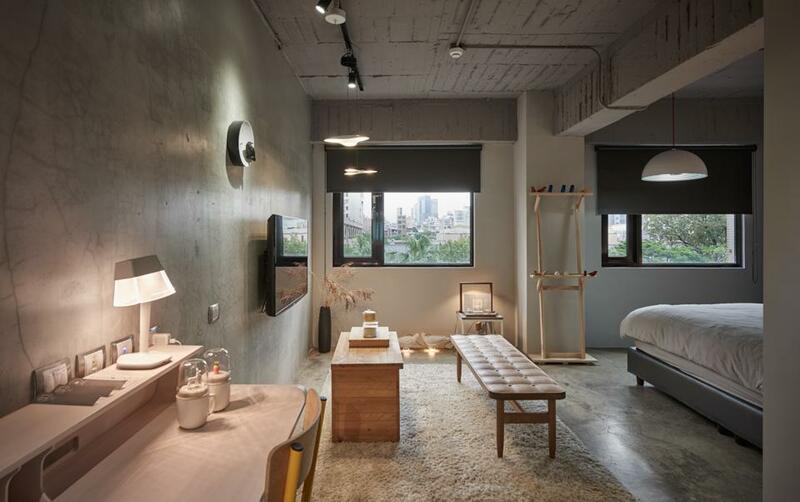 Taipei just changed the definition of a design hotel.